There are a wide variety of local tree species that are a popular addition to the property surrounding homes and businesses in McDonough, GA and the surrounding areas. These trees require professional trimming and pruning services to ensure that they not only retain their natural aesthetics and curb appeal but also to promote continued growth by eliminating defects and flaws and keeping them free of disease. 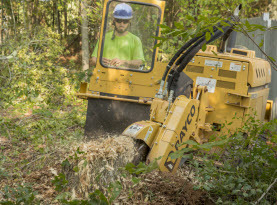 On some occasions, whether due to extreme storm damage, age or other factors, tree removal and sometimes stump grinding is necessary. 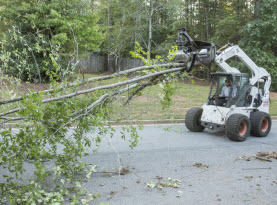 The experienced professionals at Milam’s Tree Service are the experts when it comes to correctly trimming and pruning the trees, executing dangerous tree removals and grinding down the stumps to eliminate trip and fall hazards on your residential or commercial property. With twenty years of professional service in the local community, you can be assured that the trees on your property are in the best possible hands! Live Oak Trees: The live oak can grow to well over 60 feet with low hanging branches that provide an excellent source of shade. The live oak can often be found draped in Spanish moss and is considered one of the most iconic trees found in the South. With regular care and maintenance they can live for hundreds of years. The live oak is part of the evergreen tree family, prefers full sun and can grow in a variety of soil types with the exception of clay. Bradford Pear Trees: The Bradford pear tree can be found on residential and commercial property in McDonough, Ga and while it is a beautiful in appearance, it does come with a variety of drawbacks including its weak branch structure which makes the trees susceptible to wind and rain. 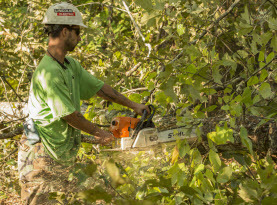 Regular trimming and pruning will help prevent the tree from breaking and splitting to lessen the likelihood of damage caused by falling limbs to property, vehicles and powerlines etc. Pine Trees: Pine trees are both beautiful in appearance and provide a fragrance that is synonymous with the holiday season. They are also easy to grow and are a popular choice for home and business owners. While pine trees are naturally hardy by nature they can be susceptible to disease including needle cast, root rot, canker disease and beetle infestations to name a few. If not correctly treated and property maintained disease that is left unchecked can weaken and kill your pine trees. American Sweetgum Trees: The American sweetgum is a favorite for both residential and commercial property as a shade tree which provides excellent coverage for blocking sunlight. The tree is renowned for its medium to fast growth rate along with its ability to thrive in various soil types including moist, sandy, clay, acidic and loamy soils with a moderate tolerance to drought. Regular tree trimming and pruning by your Milam’s Tree Service professional will ensure that your sweetgums will keep their beautiful and vibrant appearance year round. 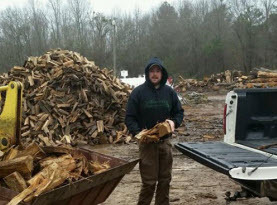 Milam’s Tree Service are familiar with all species of trees found in Fayette, Clayton & Henry Counties. Call us for all your tree service needs!